Everyone who lives in Viera knows that we have HOA’s – lots of HOA’s. If you live in Viera, you are in at least two HOA’s (some neighborhoods have more). However, we also have special districts here in Viera that don’t get talked about nearly as much yet they encompass the majority of the acreage of Viera. And, they are not HOA’s. They are governmental entities – political subdivisions of the State of Florida. If you get nothing from this article, please remember that distinction. So, for this month’s President’s Corner, I thought I would put my Civics Teacher hat on and talk about special districts. 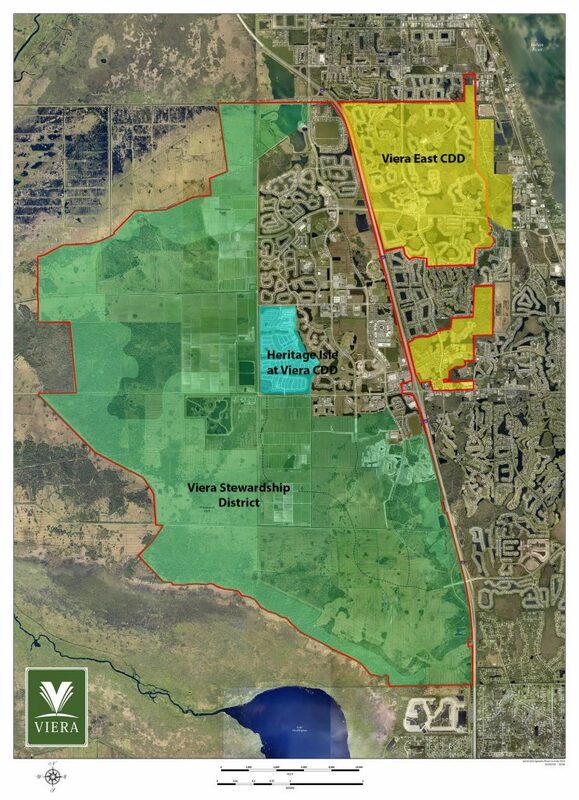 Viera has three special districts: The Viera Stewardship District, the Heritage Isle at Viera Community Development District and the Viera East Community Development District. I have a very warm place in my heart for special districts because prior to arriving in Viera, they were kind of my specialty. I have worked with special districts for the last 11 years of my public service career and was the District Manager for several districts over on the west coast of Florida. So, I like talking about them and making sure that people truly understand what they are versus what they are not. First, let’s touch on a bit of special district history. Special districts existed in Florida before Florida was even a state. Back in 1822 when Florida was just a Territory, we still had people living here, tourists, businesses and industry. And we had roads. We just didn’t have a government to take care of them. So, the Florida Territory created its first special district with “The Road, Highway and Ferry Act” to manage and maintain the transportation network that existed. Then, when Florida became a state in 1845 (March 3, 1845 to be exact), the first legislature created another special district to drain the Alachua Savannah swamp because, let’s face it, that’s pretty much what Florida was back then – a swamp. Then, this led to the Drainage District Law in 1900. These laws were the first laws on the books that dealt with managing development so they were the progenitors of today’s growth management laws. During the 1950’s – 1970’s, as the population surged and the need for more and more services grew, so did the need for other kinds of special districts such as mosquito districts, fire control districts, aviation authorities, beach erosion districts, inland navigation districts, etc. The state recognized that these services could be provided and financed in perpetuity through the creation of these special districts without burdening the state coffers. In other words, these districts provided needed services but did not require funding from the state government. Now, if you go back to the Drainage District Law (Chapter 298) I discussed, this statute was used by developers to ask the state for the ability to build roads, parks, sewers, bridges, etc. However, because the law was not designed for that kind of request, there was no consistent application of the special district powers and so what got approved really just depended on what the developer asked for at the time. So, in 1975, Florida determined that these development districts were needed but enacted legislation called the New Communities Act that linked all of these development, entitlement and growth management processes together. From this legislation came the creation of the Development of Regional Impact or DRI. Viera is a DRI and we went through the legislative process to become one. Then more laws were created such as Chapter 190, Florida Statutes (the Florida Uniform Development District Act), and Chapter 189, Florida Statutes (the Uniform Special District Accountability Act), which are the legislative authorities for the special districts found in Viera. These are the laws that the special districts get their authority and powers from – what they can and cannot do. As you can see, there are more CDD’s than there are cities! They are a pretty common form of government in Florida and are not as mysterious as some would believe. Generally, CDD’s are created to build, finance and maintain in perpetuity the infrastructure of the community. And this can be different and vary from district to district but most commonly they include roads, sewers, stormwater drains, gatehouses, sidewalks, etc. Here in Viera, the Viera East CDD even owns and operates the golf course. So, again, their responsibilities vary from district to district. Now, the Viera Stewardship District (VSD) is somewhat different in that its current primary responsibilities are environmental in nature. The VSD is responsible for stormwater management, aquatic weed control and environmental conservation such as the compliance monitoring of the Habitat Management Plan for the Viera Wilderness Park. The VSD is also responsible for preserving and maintain certain areas of tree canopy within its boundaries. Since these special districts are not HOA’s, you do not receive a “bill” from the district to pay your assessments. You actually pay for your assessments on your Brevard County tax bill as a non ad valorem assessment. Another aspect of special districts to remember is that since they are governmental (public) entities, they are required to follow many of the same Florida Statutes and laws that any city/county must also follow such as public records laws, public meeting laws, financial disclosure laws, etc. I am hoping you can see why I find special districts so fascinating. They have a rich history in Florida and have been very influential in our governmental landscape as well as our state’s tax structure. There is obviously a lot more information on special districts and how they operate throughout the state, but I don’t want this article to turn into a book. Therefore, I will leave it here for now and encourage you to reach out if you have any questions.